Behavioral scientist B.J. Fogg researches how small changes can transform your life. Admiral William H. McRaven advocates building momentum through completing small tasks at the beginning of the day. For author Charles Duhigg it’s habits and for Dr. Judsen Brewer, self change rests on mindfulness. Every few years a new productivity technique emerges as the one true method to rule them all. But a better model is one that sees them all as pieces of a greater puzzle. As elements with unique characteristics and applications, they’re like building blocks that can be stacked and strung together. As a young professor in Russia, Dmitri Mendeleev grew frustrated at his student’s inability to follow his chemistry lectures. But there was a good reason. Though chemists started identifying elements in the mid 1700s, there wasn’t a standardized system detailing qualities and relationships between substances. Delving into the problem in his classic text, Principles of Chemistry, he arranged elements in terms of atomic weight and shared properties. His breakthrough resulted in the Periodic Table of Elements. Though motivation has a low half life (January 17th is National Ditch Your Resolutions Day) and habits presumably last forever, productivity techniques don’t have a concrete analog to atomic weight; there is, as of yet, no agreed upon willpower unit. 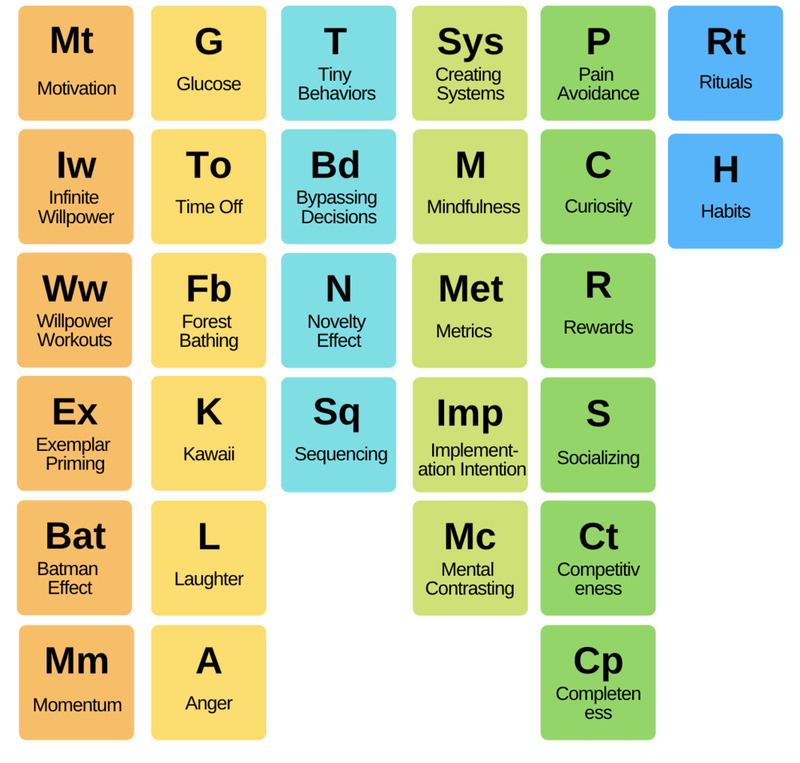 But just as Mendeleev’s table was sorted by families so too can behavioral methods be grouped into those that Strengthen, Observe, Replenish, Diminish, Reward, and Automate. A number of recent books and studies have supported the idea of willpower as a resource. This family stretches out that initial resource in some way. You can use Motivation to psych yourself up, whether through music or vision boards or just “digging deep”. This is usually the very first method people use, and it’s perhaps the least effective. Willpower Workouts are based on studies that suggest that self-control acts like a muscle. Exerting it artificially (like using your non-dominant hand throughout the day) will increase your starting pool of it. Exemplar Priming recruits resources through either optimistic or inspirational text to influence the ego’s view of itself, resulting in better discipline. Or, you can just borrow those resources. Pretending to be an exemplary fictional character has been shown to increase perseverance with the Batman Effect. Momentum does this in a different way, by increasing confidence and overcoming inertia with a series of wins. The Hawthorne Effect, known as the Observer Effect, describes how behaviors positively change solely by being observed. Creating Systems does this by focusing on the process of a skill rather than the output of one endeavor. Mindfulness, the minute observation of the self, has been shown to have numerous benefits especially in breaking vices. Creating and noting specifics is the realm of Metrics, which allows the mind to grasp and have a record of behaviors that might not otherwise be noticed. Implementation Intention is a formal statement of cause and effect that can radically change behavior in habits and even in focus. Meanwhile, Mental Contrasting is an exercise used to analyze what exactly a behavioral change entails. Functionally this troubleshoots by listing out the pros and cons of a change, and what could possibly go wrong while doing it. Sometimes you need more fuel to start with, and sometimes you just need to refuel. This family focuses on regenerating willpower and the rewiring involved in long-term learning that’s cultivated by rest. The most literal version of refueling is eating. Glucose positively influences cognition and energy, and it may play some role in willpower generation. Time Off is not only necessary for replenishing self control, but for learning, focus, and mental and physical health. Microdosing on nature through Forest Bathing can improve happiness and wellbeing, having long thought to have a general restorative effect. Emotional cues can also renew willpower resources. Harnessing the power of Kawaii through viewing cute images surprisingly promotes focus and performance, as can Laughter and Anger. While the first two families dealt with increasing fuel in some way, the next few deal with bypassing expenditure issues entirely. Tiny Behaviors lower the expenditure of willpower, while Bypassing Decisions takes away the need to use it at all. New procedures can reset willpower and focus through the Novelty Effect, and in a related element, changing up Sequences, can make learning and skill acquisition more efficient. Rather than changing the performance of a behavior, this family incentivizes what you do. The classic Pavlovian treatment is Avoiding Pain and employing concrete Rewards. Some more ephemeral rewards include Socializing and the satisfaction of beating someone (yourself or others) in Competitiveness. Completeness is a specific type of reward involving the hunger to get it all. This can take the form of a compulsion to collect or perfectly beat every level in a video game. It can also include the inverse, the fear of missing out on an experience. This family removes all external cues in favor of regularity. Rituals can act not only as an interceding wedge to break apart triggers and responses, but they can also emphasize focus, athletic performance, taste, and rejuvenation through random consistent behavior, often involving objects or implements. Habits involve repetition, time, association with the self, and automaticity. Combined together, habits work regardless of mood or circumstances, and as such have the longest staying power, balanced on the very opposite end of the chart from Motivation. This blueprint can not only better illustrate common self-development strategies, but why addictive behaviors are so powerful. Take for example, “Don’t Break the Chain” apps. Popularized by Jerry Seinfeld, the comic used a calendar to keep track of the days he worked on new material. Every day he discharged the behavior, he would draw a large red X across the day. It got to be satisfying to simply not break that chain, and many people have talked about how it helps them stick to goals. Broken down, this strategy employs an INTENT (“I will record when I discharge my habit”) to use METRICS (red Xs), where COMPLETENESS (a week where all days have Xs) and REWARDS (the satisfaction of seeing a marked calendar) fosters MOMENTUM (“On day 20, even if I don’t want to do it, I will, because I’ve done it for all the other days”). It’s a TINY HABIT that is a RITUAL (the fire, the movement to another place, implements like the lighter), often involving SOCIALIZING (a community of other smokers), MINDFULNESS (observation of the flow of the world or just the smoke swirling), TIME OFF (often from work), and concrete REWARDS (the hit of nicotine). Borrowing from Dr. John Perry’s concept of Structured Procrastination, Structured Randomness was an effort to solve meal planning issues. While meal prepping can bypass decision making throughout the week (preventing Decision Fatigue) it can often be too draining or impractical to make every single meal ahead of time. Here, a once-a-week habit is created of intentionally randomizing the meals made during the week. Harnessing The Novelty Effect, it allows not only for a boost in adherence, but as a side effect creates interest by fostering the exploration of new recipes. How do you remove a habit? While the current, popular advice is to just replace the trigger or response in a habit loop, in many cases this just isn’t practical. Instead, by using a tally counter, we can use curiosity and metrics to monitor the diminishing of the habit. And by using click training, we can wedge an action in between the trigger and response. When you’re absolutely drained of willpower, I’ve found that stitching together a series of theories on renewing discipline comes in handy. Switch up your schedule, bring your tasks down to minimums, and accomplish a few goals to bring the power of momentum on your side. Eat food to boost energy, do an exemplar priming exercise to build self confidence, and distance yourself from your feelings with mindfulness. Bolster your mood by watching funny videos, going out for a walk, and scrolling Reddit for cute animal pics. Crafting a long term consistent practice is critical for everything from physical or mental health to laying the foundations of any skill. The most efficient method I’ve found is to supplement B.J. Fogg’s Tiny Habits with psychologist Gabriela Oettingen’s WOOP (Wish, Outcome, Obstacle, Plan) Method. Tiny Habits lowers the daily minimum in order to form habits, WOOP creates a specific intention while planning around future problems, and using a system of metrics prevents interruptions (like large gaps in the discharge of routines) from becoming permanent. An efficient routine will start small, but can often become difficult to level up. And that’s critical to reap long-term benefits. To level skills up for time, try shortening them, then changing up the workout. Rather than shooting for 1 hour of running you’ll find it easier to try 20 minutes of biking, running, and swimming. The Novelty Effect boosts focus by shifting to a slightly different modulation of attention. This method works for pushing skills, where sequencing, tiny bursts of concentrated effort, and novelty provide effective cross training and plateau-busting power. There’s a lot here, and there’s a lot to tweak. Mendeleev didn’t have all the elements on the table either. But what this table illustrates is an updated model of what the answer to self-change really is. In the past it’s been motivation or a positive attitude. These days it’s habits or grit, but none of this captures the real truth. The answer is legion. And that’s a good thing.